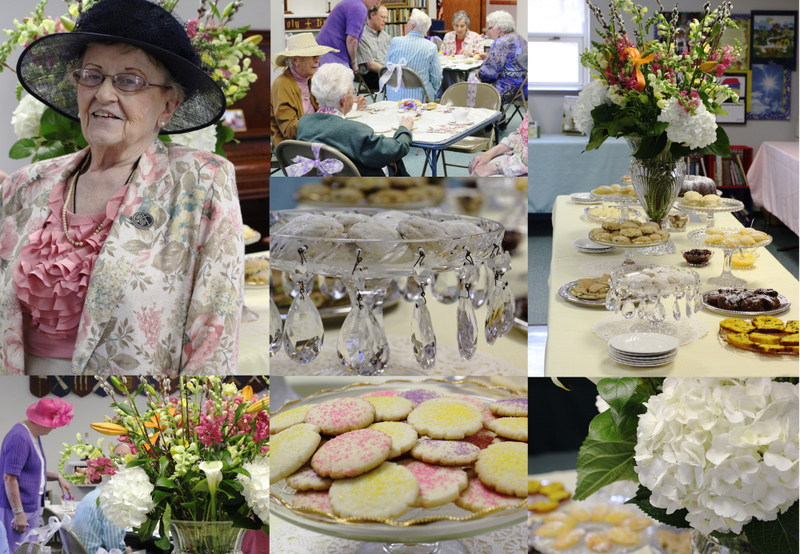 Every year, the Trinity Episcopal Church holds a tea party in the spring. I’ve been wanting to attend for awhile and this year I finally managed to be in town for the event. It was just a gorgeous day, sunny and warm. I wore my favorite pair of colorful wedge heels, a purple sundress, and topped with 40’s style yellow green feather hat complete with a little netting (from Grandma LoRetta). When I got there, I spotted my friend Annie right away. She is my favorite Aussie. She’s got a classic silver bob haircut, a pretty oversized top, cigarette pants, and always a pair of heels. On Sunday she had a pair of yellow pumps with white dots and yellow green bows, which I heard she purchased from a local shop, Bobbi Jo’s. The spread was just lovely. On a long table were some scones, cucumber sandwiches, clotted cream, jam, lemon curd, pecan cookies, fruit cake, chocolate cake, sugar cookies, madeleines, nuts, and some candy. In the middle of it was a large bouquet of lilies and hydrangeas. Everything was prepared and baked by volunteers. I had some ginger and pear tea. On my plate was a piece of chocolate cake, a madeleine, a triangle of cucumber sandwich, and a couple dots of clotted cream and lemon curd . Everything was delicious. I sat with Jan, Melissa, Annie, and Helen. Later, I also got to chat with Catherine, Lee, Kathy, Jude, and Carolyn. We talked about the internet and fashion. I learned what a “rat” was. Helen said it is a piece of wool rolled up in a woman’s hair where a hat could be pinned. The process is called “ratting”. It was meant to give a raised surface so that the hat could sit better on the head. It was a great time and I’m planning on attending again next year. The event is free and open to the public. This is just one of those things that make living here so delightful. 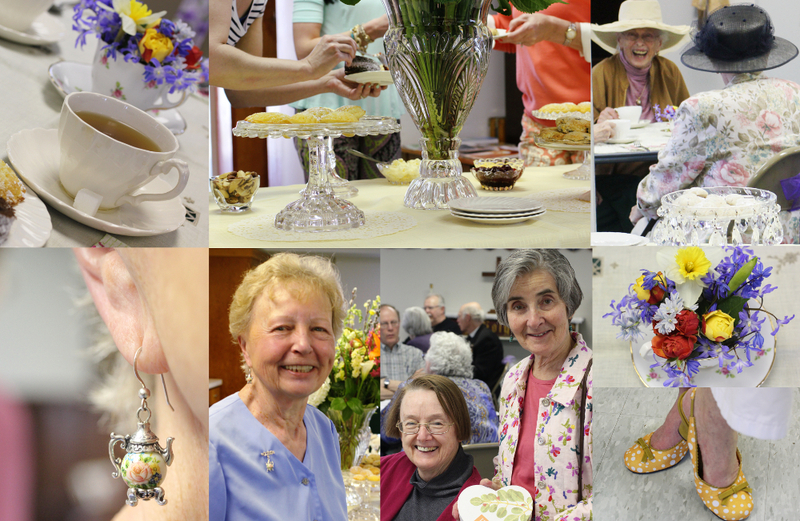 This entry was posted in Food, People and tagged afternoon tea, cream tea, English tea, Leslie Damaso, Mineral Point, tea, Tea at Trinity, tea party, Trinity Episcopal Church, WI. Bookmark the permalink. I will always miss Carolyn’s Lemon squares!